Many artists would not be interested in a residency where the studio is in the corner of a hot, noisy, dusty factory floor. However, two School of Art faculty were eager for the opportunity, which benefited them and, ultimately, their students. 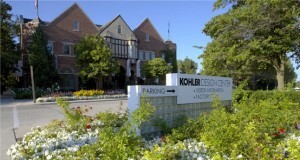 The Arts/Industry Residency offered by the John Michael Kohler Arts Center in Kohler, Wisconsin, is unusual. 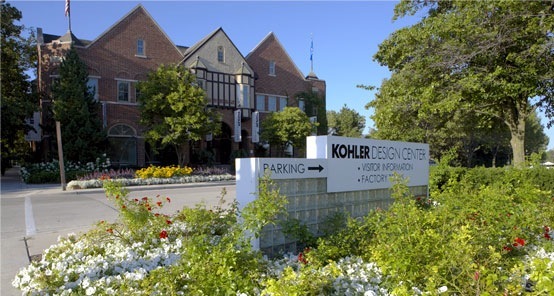 Chosen artists work at the Kohler Design Center factory with unlimited access to materials and the expertise of the factory workers. Two of the artists picked for residencies in 2011 were 3D4M Assistant Professor Amie McNeel and Interdisciplinary Visual Arts Lecturer Timea Tihanyi. The current focus of the residencies is pottery. McNeel had participated in a past foundry residency with Kohler, but intensive work with clay was new to her. The material was not new for Tihanyi who received her MFA degree from the School of Art’s Ceramics Program in 2003. Tihanyi’s clay work most often involves porcelain. At Kohler, she discovered that their porcelain was specifically developed for the scale and designs of the industrial process, so she had to learn how to handle the new material. To paraphrase her: clay is like cooking, with many different ingredients; any alteration to the recipe can alter the results. Tihanyi has also worked with molds previously, but they were typically two- to three-part molds. At Kohler, she worked with ten- to twelve-part molds. It made creating the artworks much more complex, and she had to solve some technical problems to make things work. From mid-September to mid-December, Tihanyi worked intently, creating twenty-five of the complex molds from broken fragments of industrial molds discarded by Kohler, and then casting small-scale works from them. Without her usual teaching workload, she was able to completely concentrate on creating new work, and she also found the immersion in a different environment to be a learning experience. Living in a small, industrial, Midwest town during a difficult economy was eye-opening. The factory itself was a rich and stimulating visual environment. Since the artist studio is in the corner of the casting shop, the resident’s view is the rows and rows of large molds laid out in beautiful, orderly ways. Most factory workers are large, strong men whose work process is surprisingly similar to that of a studio artist working with casting. Some of them have been at their jobs for twenty or more years, and their expertise proved to be a great resource in solving technical issues. The factory also gave her an appreciation for the elaborate processes that are still part of creating everyday objects that we take for granted. McNeel’s experience was different and not just because she was working intensely with clay for the first time. Hers was a joint residency with the Corning Museum of Glass, which meant that she spent September at Kohler, October at Corning, and November back at Kohler. While she had done some work with glass previously, the time at Corning allowed her to expand her skills with that material. She focused on the warm glass process of slumping into molds and working in the hot shop to blow into carved molds. Since creating large-scale work is familiar to McNeel, it is not surprising that she also chose to work on that scale at Kohler. The molds she made were 250-300 pounds unfilled and about 500 pounds when filled with slip. She had to learn rigging skills using the hoist because the molds were both heavy and fragile. Filling and emptying the molds was a delicate process; a missed step could mean breakage, and she experienced that as well. Because of the size of the objects she was creating, McNeel was able to make arrangements to have Kelsey Neal be her studio assistant for the first month at Kohler. Neal was one of the top undergraduate students in the Art Division when she graduated in June 2011. They learned from each other as they worked together. 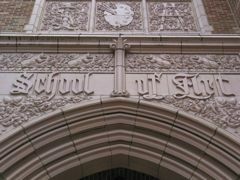 After the first month of casting was complete, McNeel was able to concentrate on surface carving as a way to refine the work in the remaining month. Both artists would recommend this residency to colleagues and students as long as the applicants understand the working environment and the fact that a lot of hard, physical labor is involved. McNeel and Tihanyi feel they benefited tremendously from their experiences, and they are eager to share what they learned with their students. They will speak about their residencies during a public lecture at the Henry Art Gallery on Thursday, 10 May 2012, beginning at 6pm.